THE PORT OF OAKLAND: It’s encouraging truckers to sign up in an effort to reduce emissions. California has millions available for purchasing new, lower-emission trucks and cargo-handling equipment. California clean-truck grants support purchasing natural gas-powered and electric rigs. California truckers can get up to $150,000 per unit in vouchers through state program. Previous clean-truck programs have cut diesel emissions 98 percent at the Port of Oakland since 2005. Port of Oakland officials are making an eleventh hour financial pitch to freight haulers this month. Their message: the state of California has millions of dollars available for purchasing new, lower-emission trucks and cargo-handling equipment. The port is meeting with trucking company owners and harbor drivers to inform them about clean-truck grants. 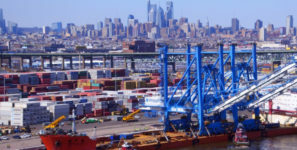 Opportunities include $48 million for purchasing natural gas-powered and electric rigs; $16 million from an air quality program for new trucks and marine terminal cargo handling equipment; and up to $150,000 per unit in vouchers through the state’s Hybrid and Zero-Emission Truck and Bus Voucher Project. The port is encouraging truckers to sign up in an effort to reduce diesel and greenhouse gas emissions in Oakland. Previous clean-truck programs have cut diesel particulate matter emissions 98 percent at the Port since 2005. The port has announced that it will introduce an updated clean air plan in 2018 to attack air emissions. It said that the plan would include working with industry, public sector and community partners to bring grant funding to Oakland. Officials from the Bay Area Air Quality Management District participated in a meeting with port truckers this week. The port plans a follow-up meeting with approximately 50 harbor drivers and trucking company owners January 22. Timing is critical, the port said, because the air district’s deadline is January 26 for goods movement grants. In other news, the port reported today that 2017 was the busiest year in its 90-year history. The port handled 2.42 million TEUs last year. That broke the previous record of 2.39 million containers set in 2014. The port also said it broke two more records in 2017: 919,523 loaded import containers and 1.85 million combined imports and exports. Imports increased four percent in 2017 over 2016 totals. December imports were up 6.4 percent over the same month in 2016. Import growth, the port said, drove its record performance in 2017.